let us be a colour in this new dawning. -from Praying with the Earth: A Prayerbook for Peace. Photo credit: Chuck Summers. We are all of God. Christ came to remind us of God. Just start somewhere. There is a seed in the rotten apple. Salve is akin to salvation. Compass is akin to Compassion. 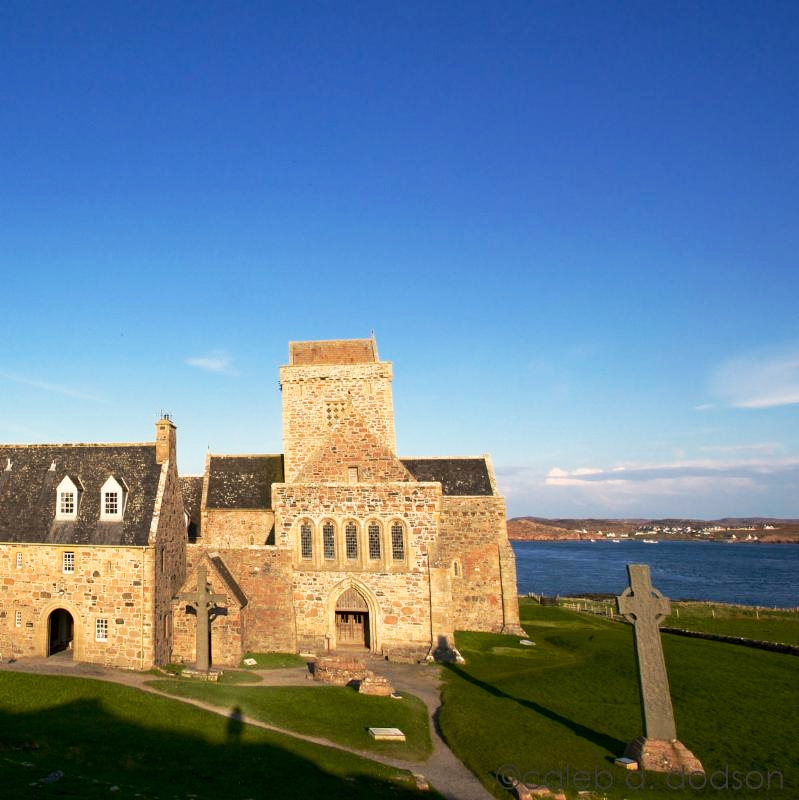 I first went to Iona in 1987 and have visited again and again. I first met John Philip and Allie Newell in 1991 when I stayed in the Abbey during a week on Celtic Spirituality. Our paths have crossed many times since then—on Iona, in Edinburgh, in New Mexico and California. Over the years, I would say that I have “absorbed” and been absorbed by their wisdom in word and worship, in music and conversation. I have taken it in. For me, a life long Presbyterian, Celtic Spirituality has served as a lovely complement and corrective to the rational, heady, orderly thinking of Calvinism. Over the years, these two sides of my faith have become more integrated. I have come to believe that the Celtic goes much deeper than the Calvinist, just as the way of John has been eclipsed by the way of the Imperial Church. But they are not mutually exclusive. I receive daily prayers from Heartbeat online and treasure this ministry. When the opportunity arose to spend a week on Iona on pilgrimage with John Philip, I felt somehow called or drawn to make the journey. As I said, I have taken in and been taken by books and prayers and teachings on Celtic Spirituality. When I was younger, I simply wanted to learn more and know more. This pilgrimage was not about gaining information or even learning in anything like an academic sense. This pilgrimage was about being in a certain place (Iona) with a certain group of pilgrims, with a teacher and guide who shared himself in a way that any of us, that each of us could take in and digest and ponder. I loved the rhythm of the days. I enjoyed the conversations around the table and as we walked. I was happy to sit in the back of the room with my colored pencils and pens and doodle as John Philip spoke. I find this way of “note taking” much more helpful at this stage of my life. What I needed to hear rose to the surface and I was able to create my own visual journal that will help me reflect on those times. Another highlight for me was the pilgrimage. I am terribly unfit and my knees hurt, but I had been hoping and praying that I could take part in the pilgrimage around the island. I had memories of doing this before and knew it would be a time of physical and spiritual challenge. John Philip helped each of us, no matter how fit or unfit, to find a way to take part in this time. Others encouraged me and walked with me and loaned me their sticks. When I finally made it to the rise above Columba’s Bay I was full of joy and gratitude. Even before JP suggested that some might want to stay in that place, I knew I would sit and pray and watch as others went down a steep slope to Columba’s Bay and back up again. In a way it was my favorite part of the day. I listened to Scottish Psalms on my iPod and pondered both the Reformed and the Celtic roots of my faith. I took in my surroundings with prayer and thanksgiving. I love the way it is all at once transcendent, mystical, accessible and relevant. For me the times of worship and prayer were also moving and rich. The body prayer we shared outside and at night was sacred time. The communion in the Michael chapel with singing led by Gillian was stunning. I am an Associate of the Iona Community and I very much resonate with their worship. I love the way it is all at once transcendent, mystical, accessible and relevant. Worshipers are constantly reminded of the Spirit’s presence here, there and everywhere and of a world hungry for justice. As we sang the Sanctus on Sunday morning, I felt the presence of the communion of saints in a way I rarely have before. All the saints, my father and Julian, George McLeod and the archangels. The week was a blessing to me–a time of growing, of quiet reflection, of challenge, of inner and outer change. I am “mulling” over these truths: We are all of God. Christ came to remind us of God. Just start somewhere. There is a seed in the rotten apple. Salve is akin to salvation. Compass is akin to Compassion. All this in the fall.